Posted 14 December 2014 by Chris & filed under Faiths. On Sunday 18th January 2015 (Homeless Sunday), hundreds of people packed into Derby Cathedral for the morning Eucharist during which a Cathedral of Sanctuary award was presented by Rose McCarthy, National Streams Coordinator for City of Sanctuary. Derby is proud to be the first cathedral to achieve such an award. The Bishop of Derby preached and presided at the service.The Dean of Derby, the Very Revd John Davies welcomed the award, saying “This recognises that the Cathedral is committed to developing a culture of welcome and inclusivity for sanctuary seekers. 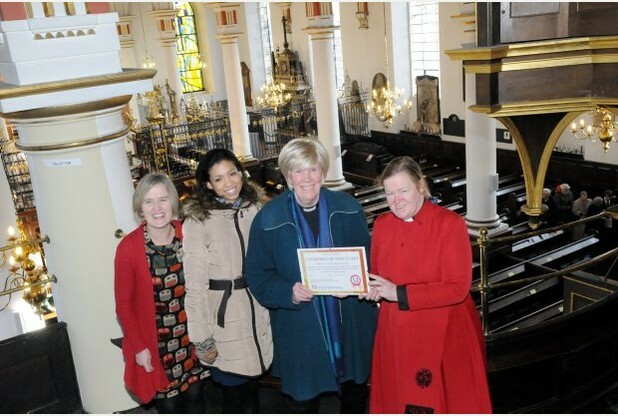 Cathedrals and churches have a long history of being places of sanctuary in medieval times, and even when that law was changed, All Saints Derby was a designated place of refuge.The Cathedral is honoured to receive the first Cathedral of Sanctuary award nationally. The doors here stand open for all God’s people “. The Dean and Chapter of Derby Cathedral have agreed to a policy document to support the Derby City of Sanctuary group in working together to support asylum seekers and refugees in the City. They have signed a resolution of support, have affiliated, and have representation at its meetings. Among the things that the Cathedral does is to be part of the Derby City Churches Night Shelter project for homeless people including destitute sanctuary seekers. Eight city centre churches provide welcome, games, friendship and a hot meal and bed every night during the winter months. The Cathedral is used on most Wednesday nights. The Cathedral is also committed to supporting inter-faith events promoting sanctuary and hospitality, the annual Holocaust Memorial Day event which involves contributions from many of the refugee communities in Derby, and Refugee Week. It seeks to work with local media and its own magazine to publicise positive stories about sanctuary seekers. It will be providing appropriate training for its volunteer welcomers to support sanctuary seekers who may come to the Cathedral, and will seek to encourage refugee community involvement in festivals, worship services and community events. It will continue to support groups and agencies working with sanctuary seekers through financial giving and the recruitment of volunteers.